Notes: Janice loves to make coats with lots of details. This coat was made for her daughter, Sydney (bottom photo), while she was a student at FIT. 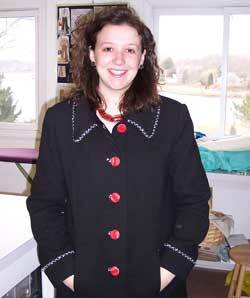 I love the piping, great bound buttonholes, contrasting undercollar and fun, bright red buttons.